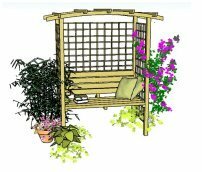 On the pergola tools and materials list - the links are listed below and also contained within the plans - tick off the tools and materials you already have and those you need to either borrow or buy. Borrowing tools can be very helpful but remember to return them in their original state or you might ruin a beautiful friendship! It has been known! 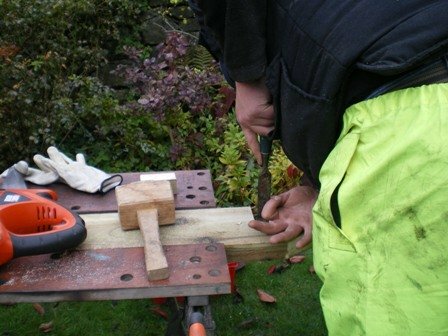 If this is one of your first journeys into DIY, and you think you would like to do more in the future, it is worth investing in some good basic tools. I have built up a toolbox over the years and it's surprising how quickly you gather together all the things you need for most jobs - one anniversary present from my husband was a kango (a heavy duty tool for breaking concrete)! Do check out the Fantastic Offers Page first, as I list many bargains on both tools and materials there. Included below are some 'Important Notes', which give links to places where you can source items locally. These notes also give suggestions on which tools are best for a range of jobs, which materials to use etc. and safety issues - no, you mustn't build this pergola in your slippers. This has also been known to happen! Either way, there should be no problems finding the what you need. 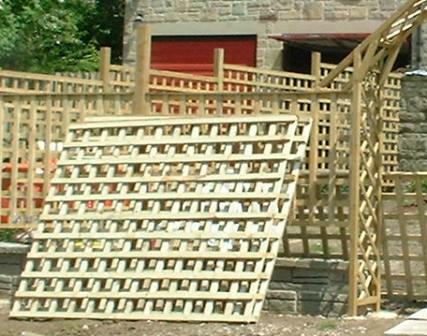 A freestanding wooden pergola with conventional notched rafters. 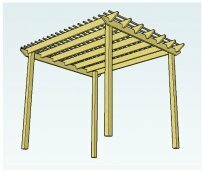 Here you can see how the pergola can be adapted in an way you choose, and how it will look when it's finished, with the addition of trellis. There is very little notching with these plans and they are super-quick to build. 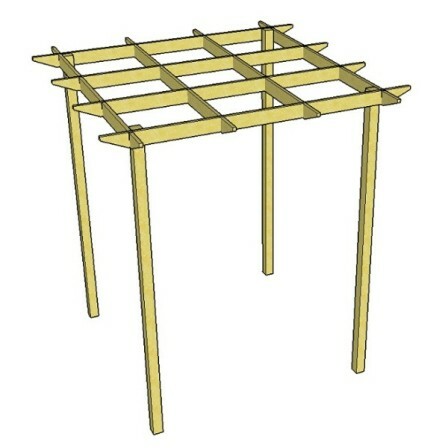 Design 1 uses trellis instead of internal rafters. Design 2 uses un-notched rafters. 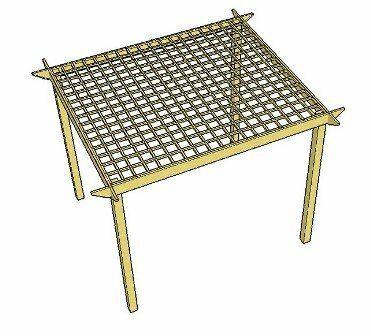 Print the relevant lists and put them in a folder with the pergola plans and the rafter tail end template of your choice. Take a look at Adapting The Plans to check if there are any adjustments you would like, or need, to make. Read the ‘Important Notes’ below. Tick off any items that you have or can borrow on both the tools and materials list. Decide which items you need, or wish, to buy. 1)	Click on the relevant tools and materials list, and print it out if you wish. 2)	Enter the item name in the search box, at the online store. The link to this is provided on each list. There may be several choices of make, model, style and design for you to choose from, all in a range of prices. The best option is usually a local timber/wood yard, where they can help you with any questions you may have. They will stock the right fixings, too. Prices will also be cheaper than buying from a DIY store. You can phone to check that they have the items in stock. 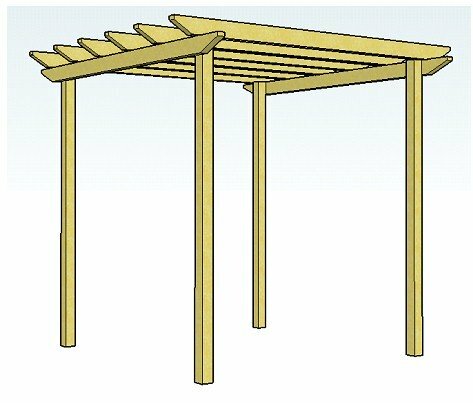 You could build the pergola using simple hand tools, but it will save a lot of time and effort if you use powered tools. Especially useful is an electric drill – either corded or cordless. One of my favourite tools is my reciprocating saw. It saves a lot of time and effort cutting the rafters. They come in both mains and cordless, but the mains-powered is preferable, as the batteries soon run down with the cordless type. Cordless tools are great because you can use them anywhere, and there are no cords to get in the way. Many jobs can be done with a cordless tool. For more heavy-duty jobs, a corded tool is handy because, generally, they are more powerful, especially when using the hammer drill action for jobs such as drilling masonry. The chuck is the part at the end where the drill bit or screwdriver bit fits. I go for a keyless chuck every time. It saves hunting for the key, and the drill and screwdriver bits are easier to change. However, over time, a keyless chuck may lose its grip a little. Tip – if you buy a drill with a chuck and key, tie the key around the cord, a little way from the drill and hopefully that way you won’t lose it! Use a power tool if it is going to save you a significant amount of time and energy. Many people have said that the reciprocating saw was their best investment. If possible have a cordless drill and a corded drill; the first for general use, and the second for more heavy-duty jobs. When doing a job where you need to keep changing the drill bits and screwdriver bits, use the corded drill to drill holes and the cordless drill to screw screws in. It saves a great deal of time changing the drill bits and screwdriver bits! Always take great care when using power tools. Don’t use in the damp or rain. Use a circuit breaker where you plug the tool in. Keep children and pets well away from the work area. Concentrate! – stop for a break regularly and don’t work when you are feeling tired. If you would prefer to put your posts in with concrete, go to Adapting the Plans for futher detailed information. Only use Metposts/Post Anchors if your ground is fairly pliable and stone free. 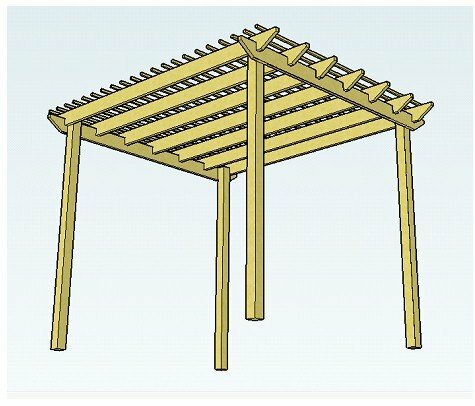 The length of the rafters will depend on how wide and deep you wish to make your pergola. You can easily estimate the lengths you will need. Measure, on the ground, how wide you want your entrance to be – let’s say 6’. Add 18” for the rafter tail ends, which gives you 7’ 6”, so you should easily be able to get each rafter out of a 8’ plank. If you want to build the pergola more or less according to the plans, then you will need 8 planks of wood at 8’(3.200m) long. You can use any type or colour of wood but it must be tanalised / pressure treated to stop it rotting. 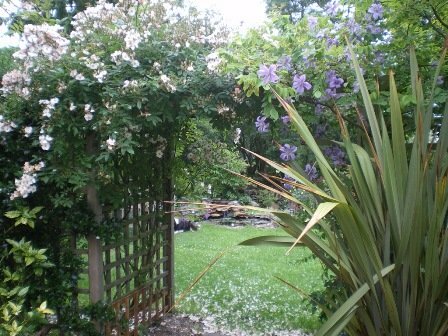 (The pergola that I built in my garden has lasted for 20 years and is still going strong). Use a cut end preserver to prevent the effects of weathering. You can paint this onto the cut ends before you attach to the structure, or do it afterwards. Un-planed wood fits into metposts exactly. If you would prefer a smooth ‘finish’ to the wood, it will have to be ‘planed’. However, this has a marked effect on the finished size and therefore will be too small to fit into the Metposts. For ‘planed’ wood, I would suggest using concrete to put the posts into the ground. The use of trellis panels is optional. You don’t need to have any or you could have 2 or 3. 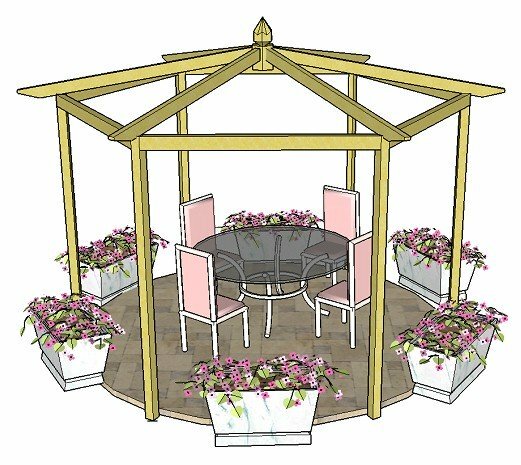 You would have 3 if you wanted to sit under the pergola, where it would act as a shady retreat, such as a seated arbour. The height of the trellis panel will usually be 6’. As the panels usually come in widths of so many feet, you would generally go for a 4’, 5’ or 6’ wide panel. Try to buy all of your wood from the same place if you can, whether it is off the Internet or from a local supplier. Now you have your tools and materials - you're ready to go!